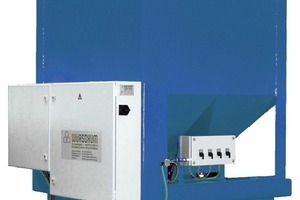 The company Würschum has successfully launched the Mini-Com precision dosing system on the market. 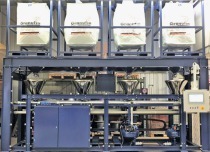 It enables the hitherto unattainable dosing precision of ± 1 g for granules. Precast elements and other concrete products with high-quality colored surfaces can now be manufactured automatically with repeat accuracy. 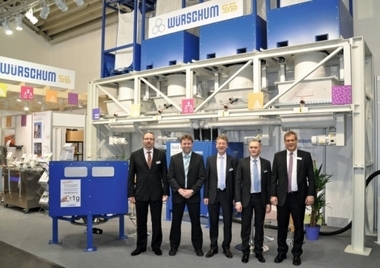 The company Würschum Dosieranlagen, based in Ostfildern, Germany, has now successfully launched the newly developed Mini-Com precision dosing system, initially introduced as an innovation at Bauma 2016. The Mini-Com color dosing system attains the hitherto unattainable precision of ± 1 g, which opens up new possibilities, especially in the area of light colors and pastel shades in combination with white cement. High-quality colored surfaces of precast elements, in particular, can now be auto­matically manufactured with high repeat accuracy – of great benefit especially when the surfaces of these precast elements must be finished after the actual production process. 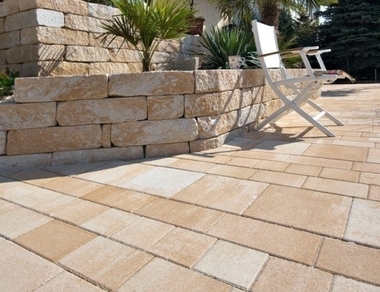 Another field of application of the Mini-Com includes high-quality color-mix concrete products such as the multi-colored facing mix for paving blocks, large-area slabs, and high-quality wetcast products. 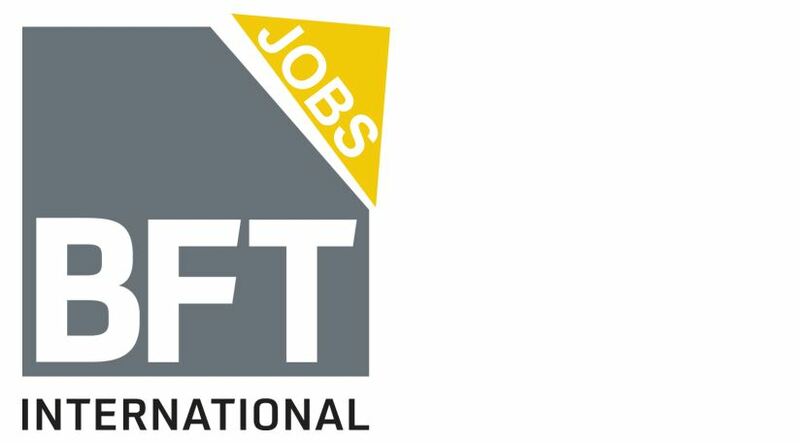 In the field of concrete, developments are going more and more in the direction of high-quality concrete products, color nuancing, and surface finishing. These products accordingly place greater demands on production systems. In respect of color, this first of all means maximum dosing precision. The individual shading of pastel colors in particular should be implemented with the greatest repeat accuracy possible. The newly developed Mini-Com 10-4 is excellently suited for this requirement. 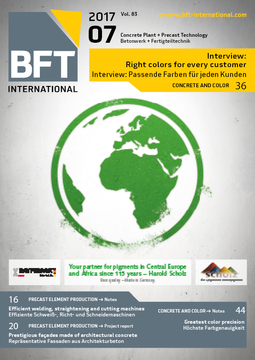 With this system, production of color combinations for additive color mixes is possible with top precision. 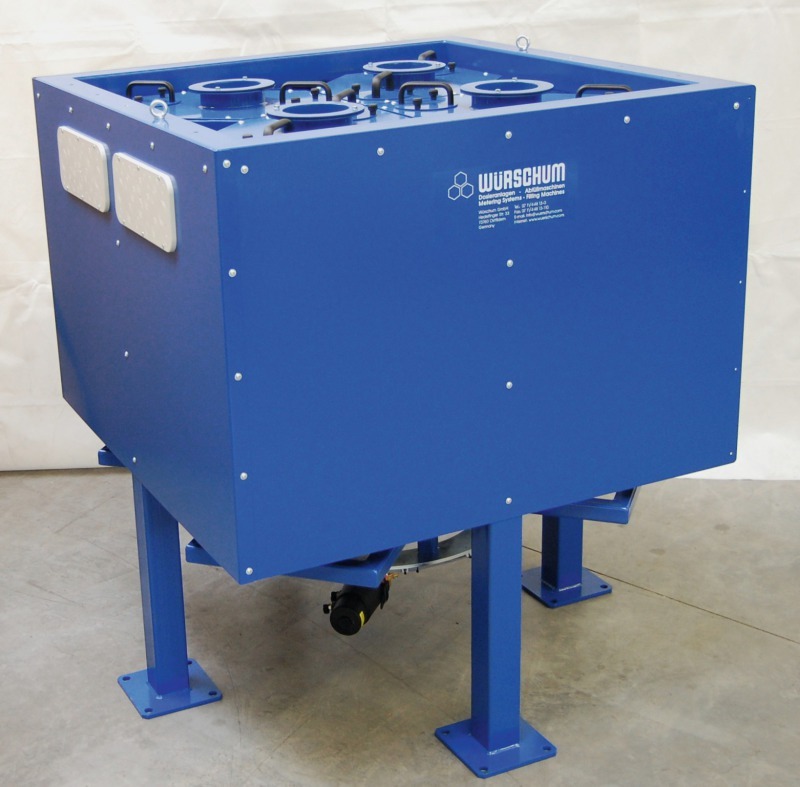 The general development for facing concrete is moving increasingly to smaller face mixers with correspondingly small overall quantities. Total quantities of only a few hundred grams are no longer uncommon. If there is demand for these small quantities mix ratios of 95 % to 5 % – for example, 500 g of yellow color and 25 g of black color – the partial quantities of the smaller components fall quickly to 20 to 40 g. To attain a reliable and repeatable color mix, the minimum possible setting of ± 1 g is of great help. 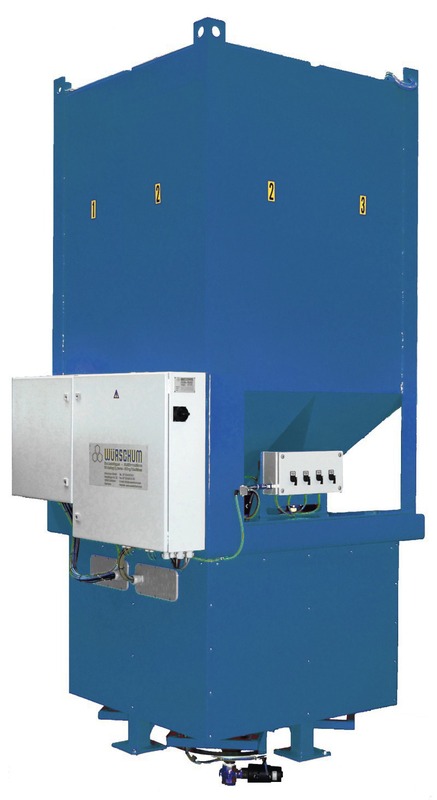 The Mini-Com can be filled from paper sacks directly into the equipment or via a segmented exchangeable container, which is filled at another point in the plant from paper sacks or Big-Bags and subsequently mounted by forklift. The segments in use are discharged into the storage funnel of the Mini-Com through pneumatic valves. The full version of Mini-Com 10-4 comes with four different color components, from which a large number of mixed colors can be manufactured. Versions with only one or two color components are also available. 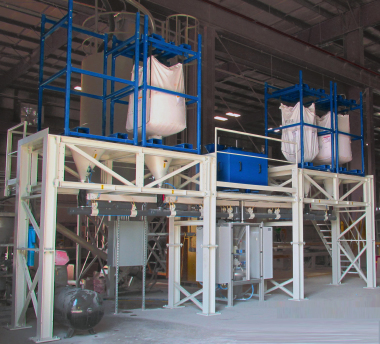 Further processing of the weighed color batch can take place either in free fall into the mixer, onto a belt, or into a hoist bucket. Appropriate emptying aids are available for this purpose. 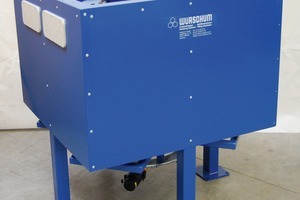 Where a Würschum COM granulate plant is already installed, it is moreover possible to mount the Mini-Com onto the previously existing color positions and then to dose the batch into the larger quantities of the granulate system. 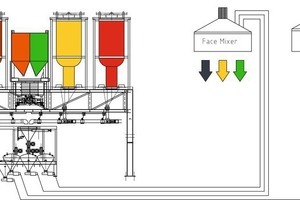 In retrofitted plants, the controls can be implemented either on a stand-alone basis or, at the request of the customer, integrated into the existing mixing plant. Care has been taken to design the Mini-Com for easy mechanical integration. For a combination of COM and Mini-Com, components of 100 g to a maximum of 30 kg of the desired color batch are weighed into the COM device by precision scale from all available Big-Bags, usually six in number. Here, the precision lies at ± 10 g and the smallest amount at 100 g. Components of between 10 g and 100 g can be predosed in the Mini-Com by means of a small scale through finely adjustable vibration channels and discharged by gravity force into the COM Big Bag dosing unit. In this way, all components form the complete desired color batch. The weighed color batch is then transported to the mixer by the pressure / delivery container that has been programmed in accordance with allocation. The scale is then lowered in order to create a dust-free connection. After the color batch has been discharged, the scale is once again raised and is available for the next color batch. 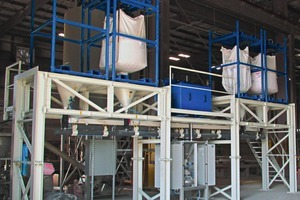 One precaster located on the East Cost of the USA, which has recently implemented the combination of the COM Big-Bag dosing system and the Mini-Com described above, now automatically processes the full range of the color quantities required in the precast industry and with the repeatable color accuracy. This large range of just a few grams up to 30 or even 60 kg per batch especially justifies investment for an automated color batching plant. This automated system allows precasters and manufacturers of paver products totally new possibilities for colors and color combinations. Individual requests of architects and builders can in this way be considered without difficulty.